Global warming: David Bryant invites you to remove the blindfold! Global warming : global con-trick! There can be few people alive today who haven't been exposed to the debate about global warming. The basic thesis is that emissions of 'greenhouse' gases like carbon dioxide are causing a more or less rapid rise in the temperature of the atmosphere. 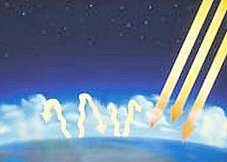 The increasing partial pressures of this and other gases (released by car exhausts, aircraft, conventional power stations and forest clearances) are said to act like the glass in a greenhouse: incoming solar radiation is absorbed and re-radiated at a wavelength that cannot escape into space. The nett result is a steady rise in atmospheric energy levels. 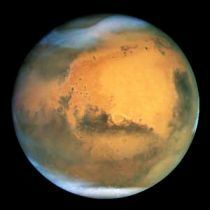 According to a 2006 news release by the US space agency, NASA, "...for three Mars summers in a row, deposits of frozen carbon dioxide near Mars' south pole have shrunk from the previous year's size, indicating a climate change in progress." Martian years are approximately twice as long as ours, so that the shrinking of the Martian south polar cap has been taking place over for at least 72 months. And, compared to the situation that obtains in our polar regions, the melting of Mars' cap is not only rapid, but large scale. According to Michael Malin, NASA chief scientist on the Mars Orbiter Camera, the polar ice cap is disappearing at "...a prodigious rate. The images, documenting changes from 1999 to 2005, suggest the climate on Mars is presently warmer, and perhaps getting warmer still, than it was several decades or centuries ago." Scientists are convinced that the Martian warming is largely due to increasing solar output, which would explain much of the recent asserted warming of the Earth as well. 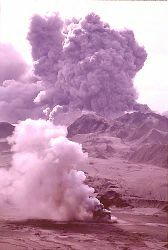 Volcanic eruptions release huge quantities of water vapor (H2O), carbon dioxide (CO2), sulphur dioxide (SO2), hydrogen chloride (HCl), hydrogen fluoride (HF) and ash (pulverized rock and pumice) into the upper atmosphere. There are 70 active volcanoes in the US alone, and, on average, there are 50 eruptions a year worldwide. 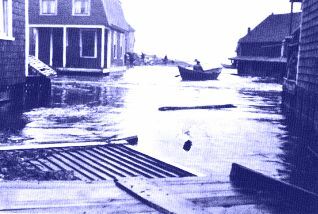 'Super eruptions', such as that of Krakatoa, Mt St Helens and Mont Pelee, are not infrequent and have a hugely more dramatic effect on the climate. Massive 'flood basalt' eruptions are believed to be a major factor in global extinctions, largely as a result of the CO2 they emit. Most of the world's highest mountain ranges are made of carbonate rocks such as limestone and dolomite. Additionally, deep layers of chalk (another form of CaCO3) were deposited during the Cretaceous Period, which ended 65 million years ago. These rocks are being subducted by continental drift and dissolved by atmospheric water, releasing huge amounts of CO2 annually. This natural process (part of the Rock Cycle) is a legacy of the immense amount of atmospheric CO2 that was 'scrubbed' during the Mesozoic Era by brachiopods, ammonites, lamellibranchs, bivalves and other marine molluscs, and by the incredible populations of foraminifera that existed at the time. The White Cliffs of Dover are entirely made up of the microscopic shells of these unicellular organisms! The Rock Cycle, then, is merely restoring the Earth's CO2 partial pressure to its natural level. It is often said that the Rain Forests are 'the lungs of the planet', and that their depletion is hastening global warming. 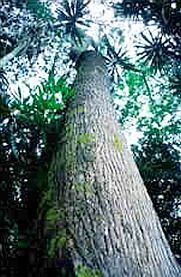 In fact rain forest trees such as mahoganies, teaks and rosewoods are nett producers of CO2: most of their mass is in the non-photosynthetic trunks and branches. It is said that burning and clearing the forests releases the CO2, but remember: the trees are not immortal! They would have released the gas when they fell and decomposed naturally! And in any case, rain forest hardwoods are far too value to burn! They are exported as timber. Finally, it should be remembered that the grasses with which the trees are replaced are nett producers of oxygen and are virtually 100% photosynthetic! If only some of what is written above is significant, why is it generally suppressed? Well: just ask yourself who benefits from the 're-education' of a generation? Firstly, a cynic might point out that investment in 'alternative technologies' such as wind turbines (which have already been shown to be a lamentably poor substitute for conventional sources of electricity) is providing wealth for engineers, architects and manufacturers! This is exactly the same kind of subterfuge that brought the US into the Vietnam War! Secondly, reducing the dependence of the first world upon crude oil also reduces the political power of oil-producing nations such as Saudi Arabia, Iran & Iraq that have no other significant income. Fourthly, it allows politicians at local, national and global level to criticise others and divert attention away from themselves and their past failures: notice how Kyoto hit the headlines about the same time as people were beginning to question the probity of the Iraq incursion? Certainly worth thinking about, surely?